In a similar spirit to the opening diamond technique, you can create a middle stem and catch it from the sides to create a zig zag pattern. This different aesthetic forces us to explore different wrap placements as everything becomes asymmetric. 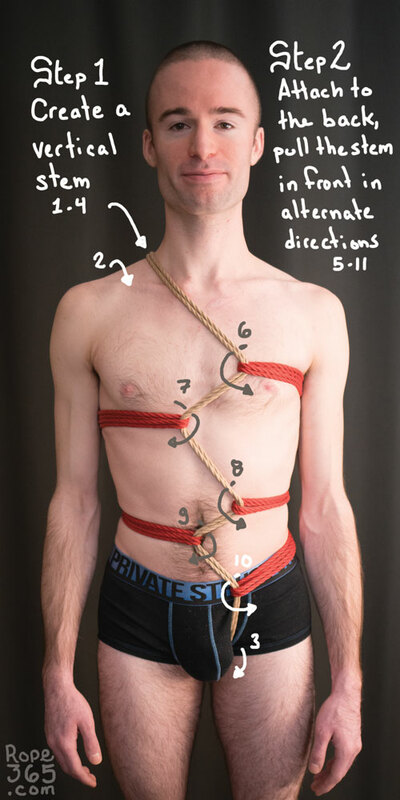 Make your own serpentine harness! Magic trick: Try to remove the stem without untying the rest. What other techniques can we use to create a zig zag pattern? Hint: chain sinnet and slip stitch.